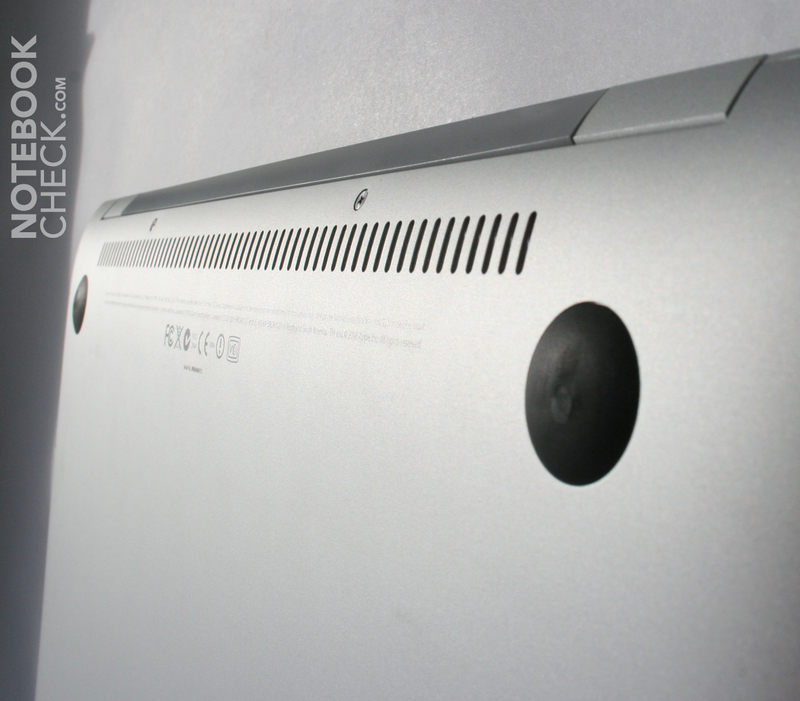 Around a year and a half ago Steve Jobs introduced the MacBook Air. 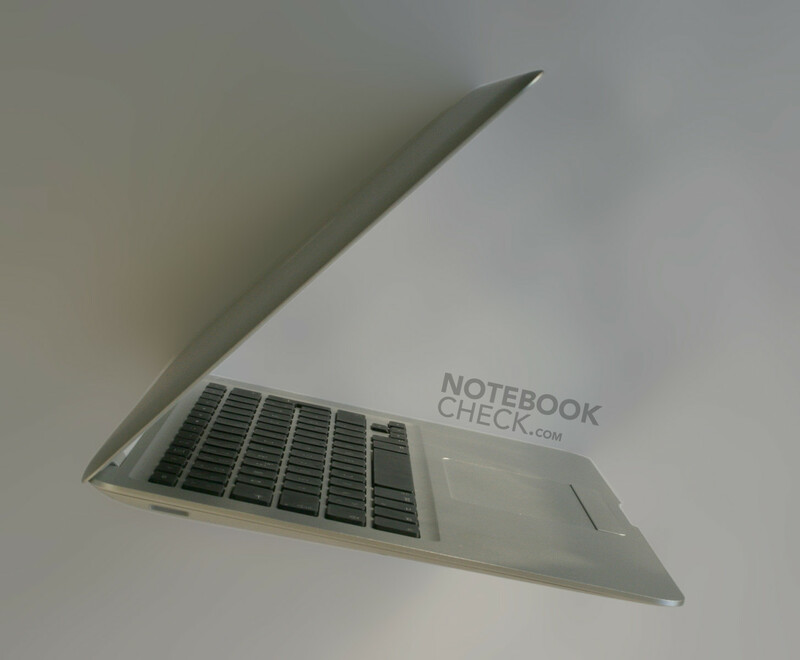 Even if it was partly refuted, it was advertised as the "thinnest notebook in the world". What was fascinating about it: at the time there was still no mention of the current ultra-slim trend. After the netbook boom there is now a trend towards especially thin notebooks, the Air now seems more in fashion than ever. 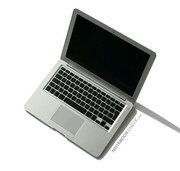 Apple furthermore recognises the signs of the times, and overhauls the hardware equipment of the laptop. The following review primarily concerns the hardware side of the update. 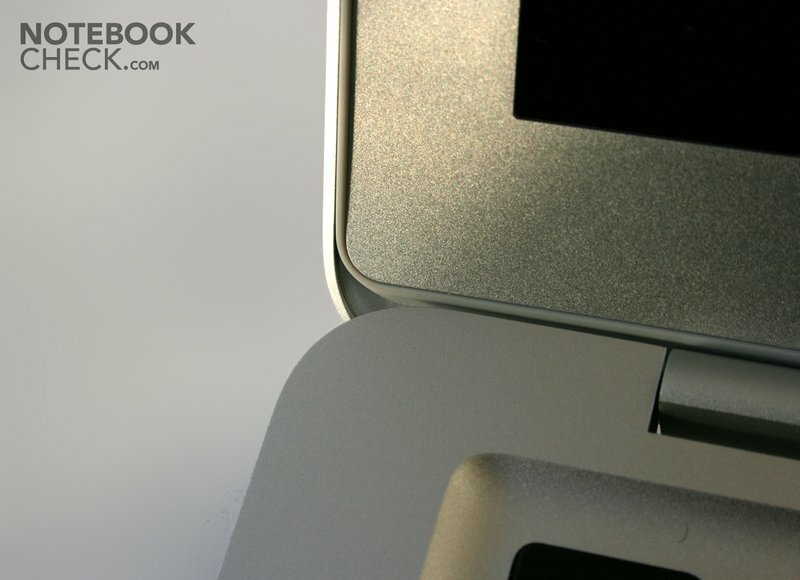 As barely anything has changed in many areas, parts of the review of the MacBook Air (MBA) from 2008 have been carried over, or respectively when required, amended. 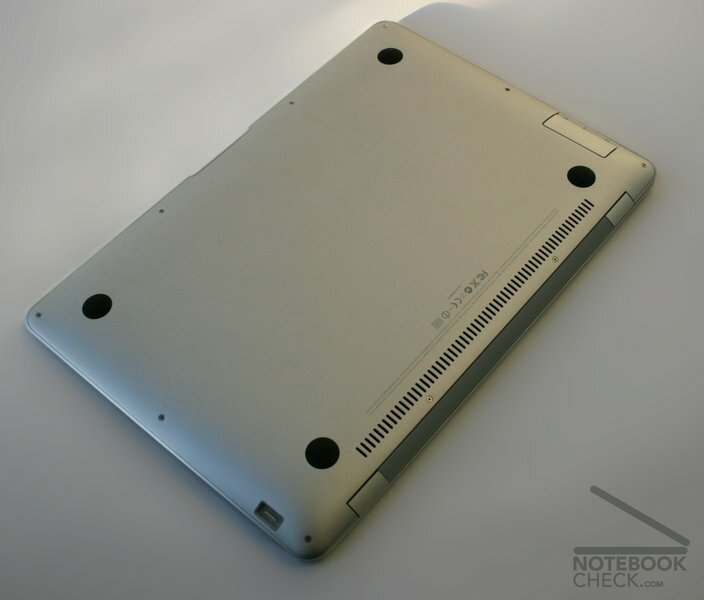 Also the images correspond in parts to the existing review, as the appearance of the laptop has not changed. The device was tested with Windows Vista and Mac OS X 10.6 Snow Leopard but if not meantioned, Snow Leopard was used. 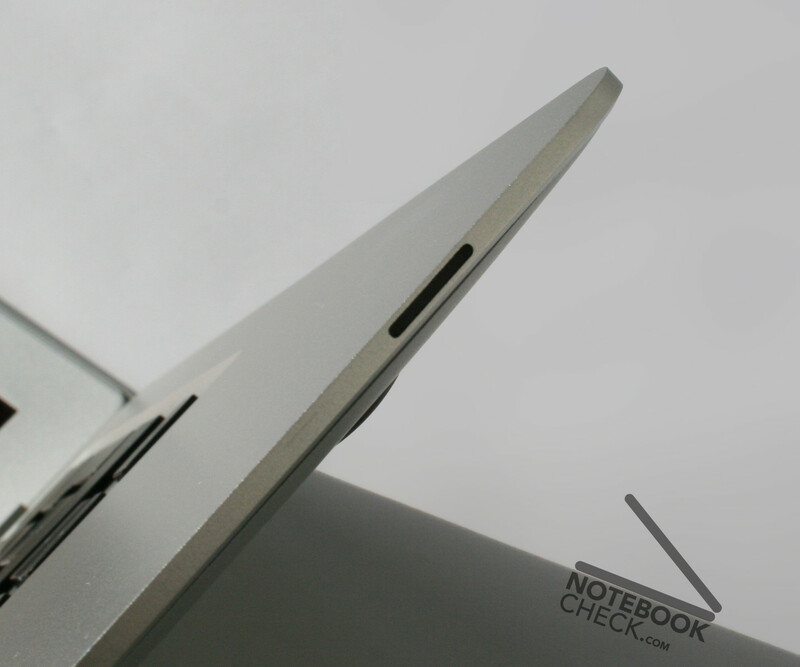 The design of the MacBook Air is dominated by the astonishingly thin profile. Thanks to the flattening of the subshell to the border, the flat appearance is visually reinforced even further. The simple appearance is pleasing at first go. 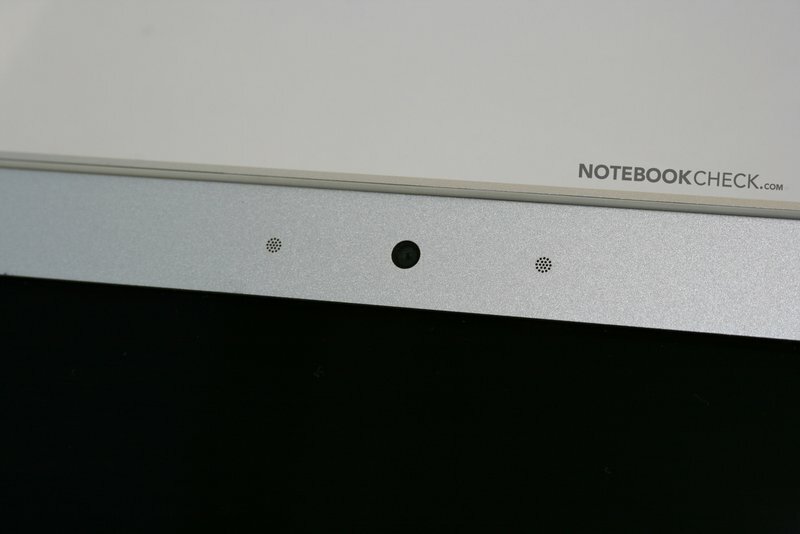 The whole notebook appears to have been milled out of one piece of aluminium and sets optical standards. 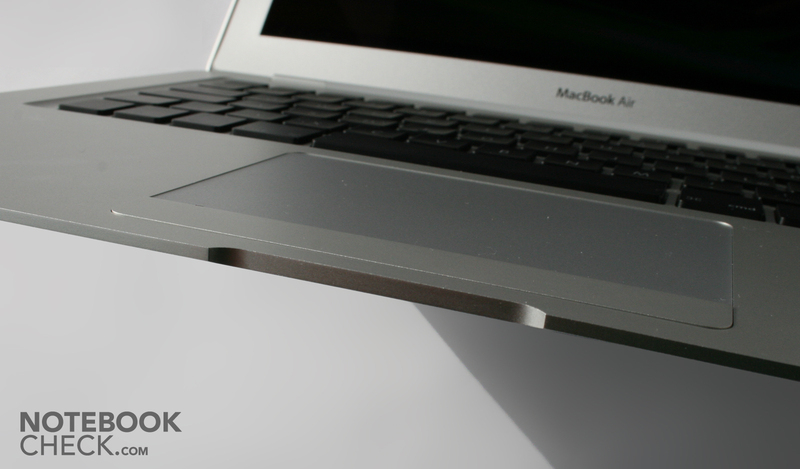 There's one thing our team agreed on - the MacBook Air is simply beautiful and in real life seems even more desirable. The workmanship of the MacBook Air is excellent, as you would expect from Apple. The deployed aluminium feels high-quality and no visual workmanship weaknesses stand out (like uneven gaps). The pressure resistance of the subshell is great thanks to the massive use of aluminium - nothing bows. The display lid is slightly more bendable due to its low thickness (e.g. in comparison to the thicker MacBook Pro lid). Nevertheless the rigidity is very good and the aluminium alloy appears to protect the panel well. Even the small aluminium cover, which houses the 3 connections, seems durable and high quality. The shapely display hinge is easily and precisely used and leaves behind a relatively stable impression. Unfortunately the mechanism limits the maximum opening angle, like all current MacBooks. This is extremely disturbing for use on the lap. When closed, the display lid is held by a magnet (however not particularly strongly, thus attention is advised when in transport). 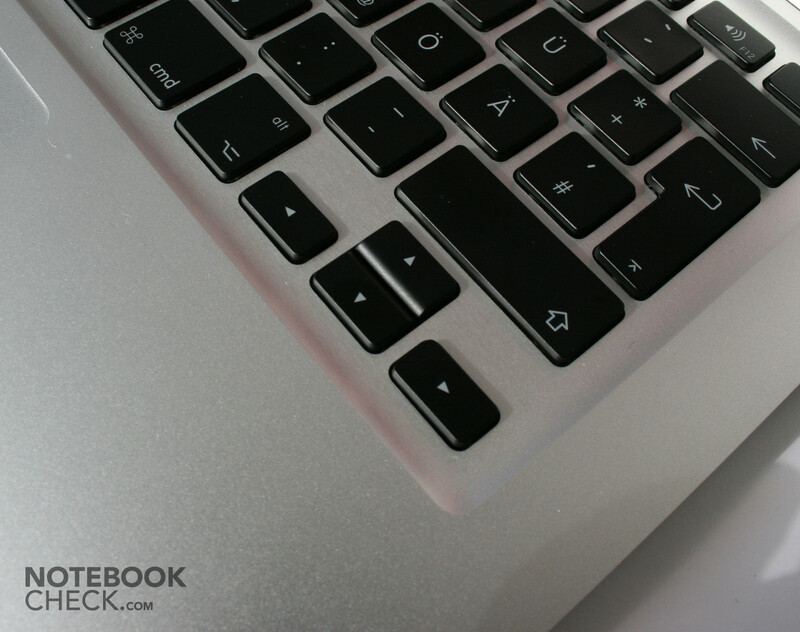 Thanks to a small rubber border the MacBook Air closes cleanly and evenly. On the whole, Apple (particularly in this segment) once again sets new standards in design and workmanship. In several forums you can read about the broken display hinges of the MBA. Subjectively they turn out to be very delicate, in fact. Even if no problems could be observed in the test sample, of course material fatigue from intensive use cannot be ruled out. This is presumably directly connected to the opening angle being limited to around 128 degrees. Upon opening the display you almost always meet the end of the maximum angle, which eventually can lead to damages to the hinges in the long run. For the MacBook Air owners as well as for those potentially interested, it's thus only to be advised that you should carefully and gently handle the closing mechanism. 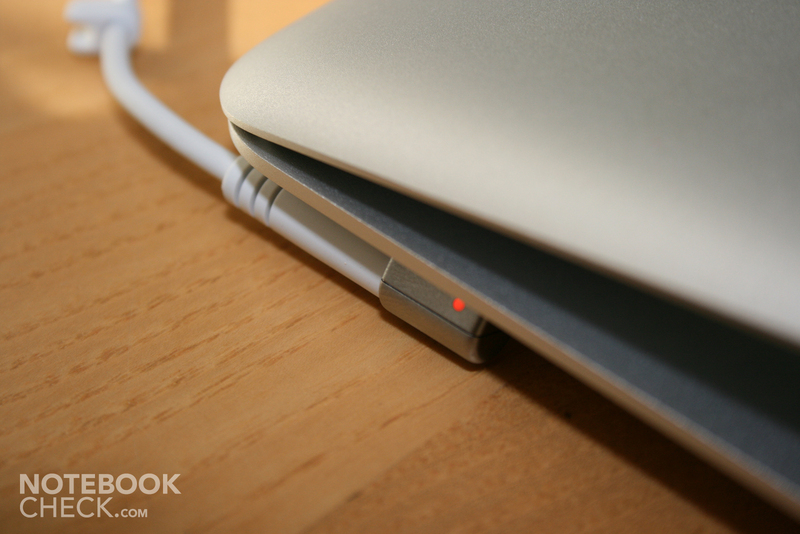 The MacBook Air still delivers only some very basic connectivity, with one big change nevertheless. The Mini-DVI connection is substituted by a Mini-Display Port developed by Apple. Via an optional adapter that is subject to a surcharge this can be upgraded to a DVI, VGA or a Dual-Link DVI connection. Alongside the digital image output there is also a single USB port and an audio output on the right side, hidden behind an appropriate hatch. The position of USB ports is an important point of criticism. Thus the connection of a rather wide USB stick or a USB UMTS modem stick can lead to problems. 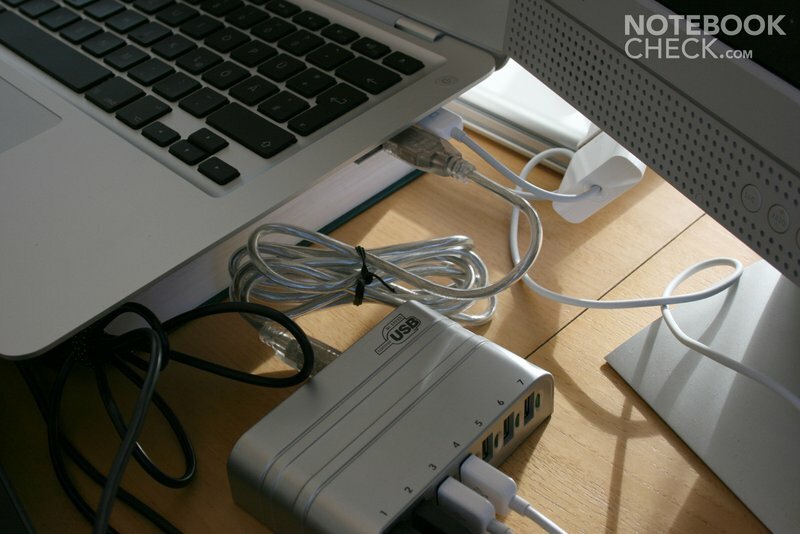 In this case you should carry along a USB extension cable. You should also take into consideration deductions when it comes to the integrated communication features. The notebook supports no built in wired Ethernet connection. Still Apple provides an USB LAN adapter but this one sacrifices the only USB port and runs only at 100MBit. Wireless is supported by the MBA in the form of the AirPort Extreme (802.11 a/b/g Draft-n) module. Bluetooth 2.1+EDR is likewise integrated into the device. What is lacking for the Europeans when it comes to UMTS/HSDPA would be WiMAX in the USA. Both are not offered by Apple in Air. A point for which you can refer to the existing review once again. When it comes to looks and touch we couldn't notice any changes. 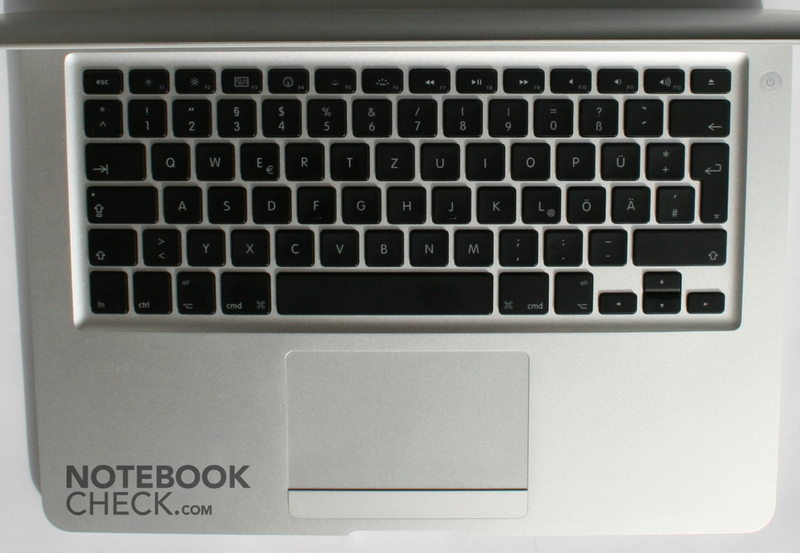 A speciality of the subnotebook is the full-size keyboard with 1.5 cm x 1.5 cm keys. 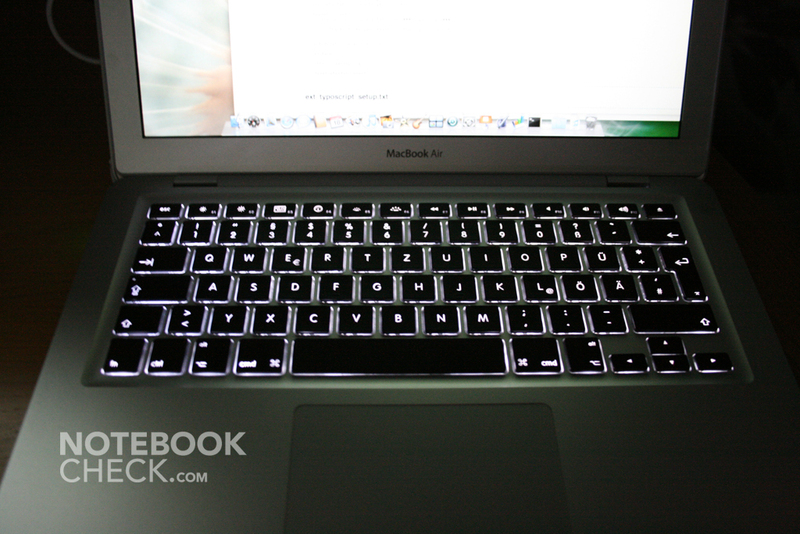 The keyboard looks very similar to the MacBook keyboard and is flawless to use. The typing comfort is subjectively in our opinion even better than its bigger brother - the MacBook Pro. Only the arrow keys are slightly rubbery and small (0.7 cm height). The lettering is oriented towards the new Apple concept with "cmd" instead of the "Apple" key and excellent special functions on the function keys (the MacBook Air offers no special keys). As usual a point of criticism is the fact that the braces and brackets are not lettered (Alt + 5/6 or respectively 7/8). For Windows users with programming ambitions, this is unfortunately annoying. 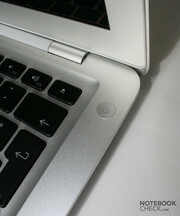 The large touchpad can be effortlessly and precisely used. The new multi-touch features for example "zooming", "browsing" and "turning" work intuitively like on the iPhone and fit well into the overall handling concept. 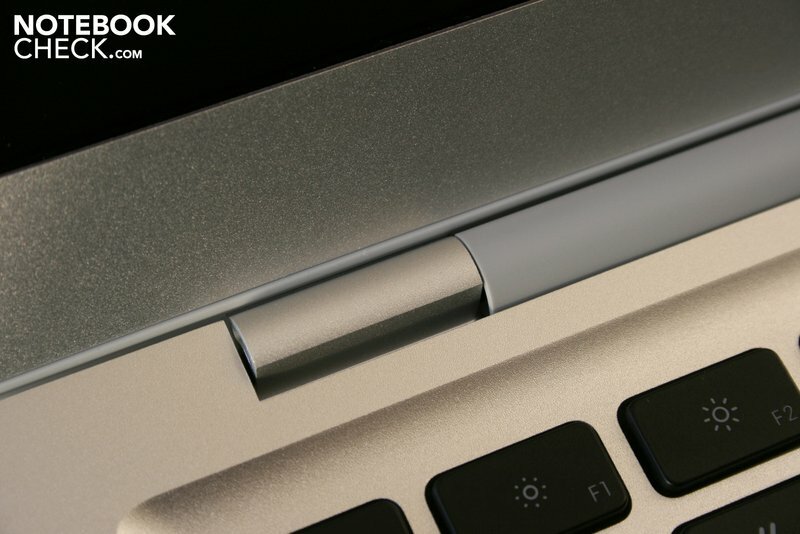 The single touchpad key unfortunately offers no "right click" as always and needs some getting used to at the beginning due to its height. Overall an excellent impression of the input devices, not only for subnotebooks, remains, which also allows you to work on them for a long time without problems. The test results turned out very similarly to those of the Review MacBook Air 2008 with consideration of a certain manufacturer tolerance as well as possible measurement imprecision. As a maximum the high-luminosity LED display provided 340 cd/m2 in the central display area. Also a strong brightness drop off in the corner areas was observed, in particular on the right underneath, up to 215 cd/m2. Concerning illumination the laptop thus provides only a below-average value of 63.2%. With the naked eye you can thoroughly notice a clouded presentation with a plain background, particularly when booting up with medium brightness. Once again the maximum possible contrast turns out excellently. The subjectively full black is confirmed by the measurement of just 0.49 cd/m2. Hence finally the maximum possible contrast ratio results: 694:1. These measurements support the positive image impression for multimedia content. 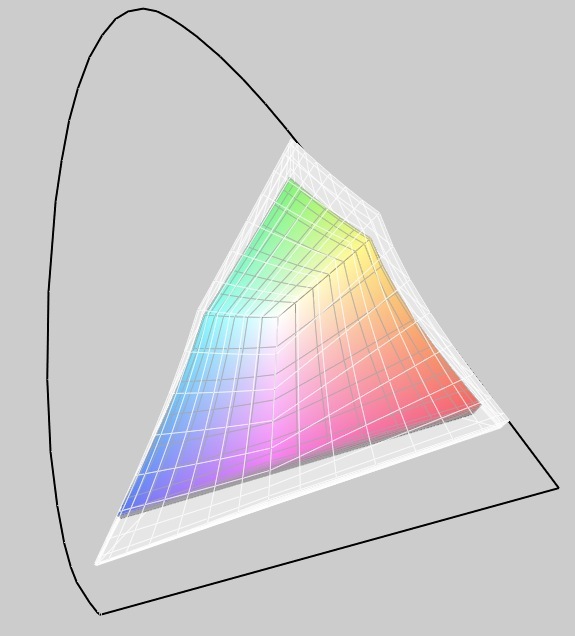 According to our measurement, in the new MacBook Air there's a panel with good colour production, indeed no "Wide Gamut" display as assumed in many places. In direct comparison with a conventional display (FSC U9200) the panel turns out clearly better. 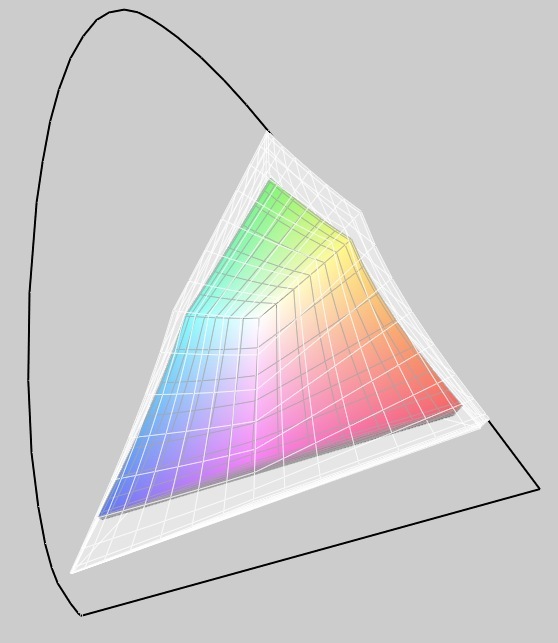 If you compare the produced colour space with that of the current MacBook Pro 13“, the Air indeed performs worse. Both of the colour spaces RGB and sRGB therefore lay outside of the grasp of the display in the MBA. Conceived as an ultra-mobile notebook, the use of the MBA outdoors is open to debate, of course. The reflective display, in this respect, is indeed worrying at first, yet the practical test speaks for itself. 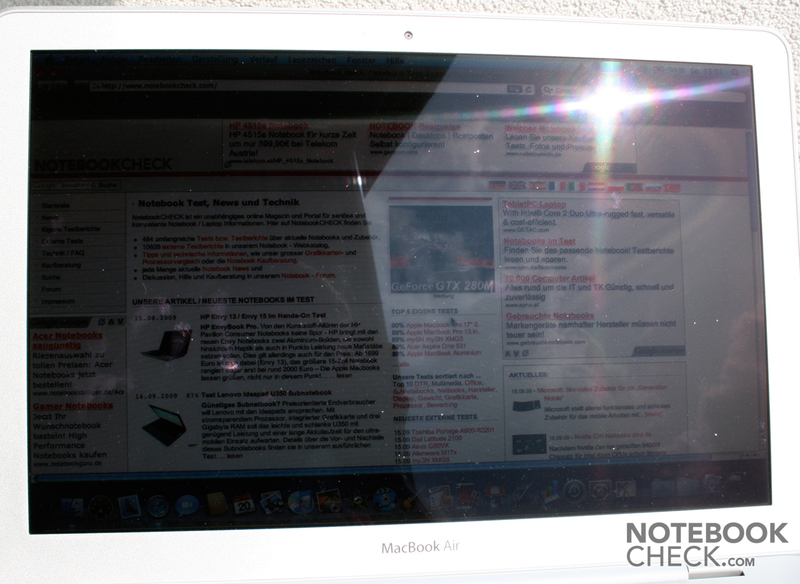 Apple may have applied an anti-reflection coating, as at certain angles a slight blue-red shimmer was visible. Also thanks to the excellent display brightness, of which 100% is available when running from the battery, possible reflections are outshone. On the whole the MacBook Air can also be used outdoors. 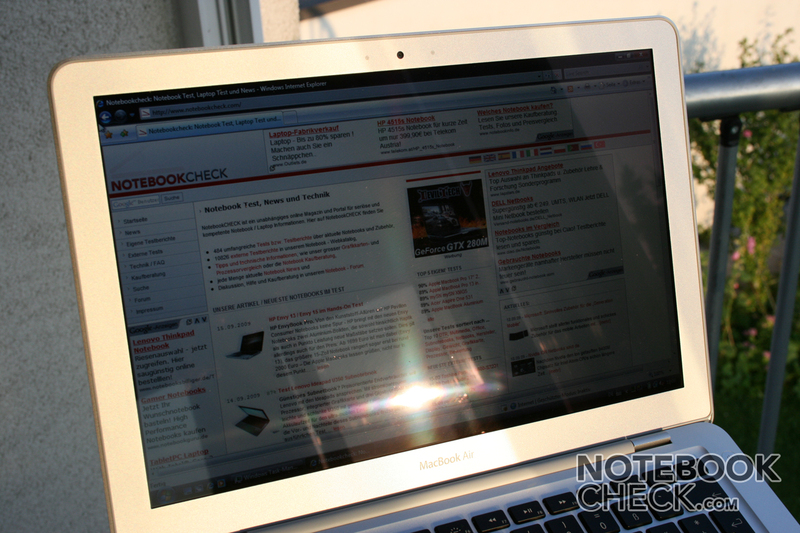 The limitations compared to other glare-type notebooks are fundamentally smaller. In terms of viewing angle stability the display turns out to be quite acceptable as well. In the vertical field indeed it leads to image distortions from a strong truncation of the viewing angle, on the whole the viewing angle tolerance proves to be arguable. 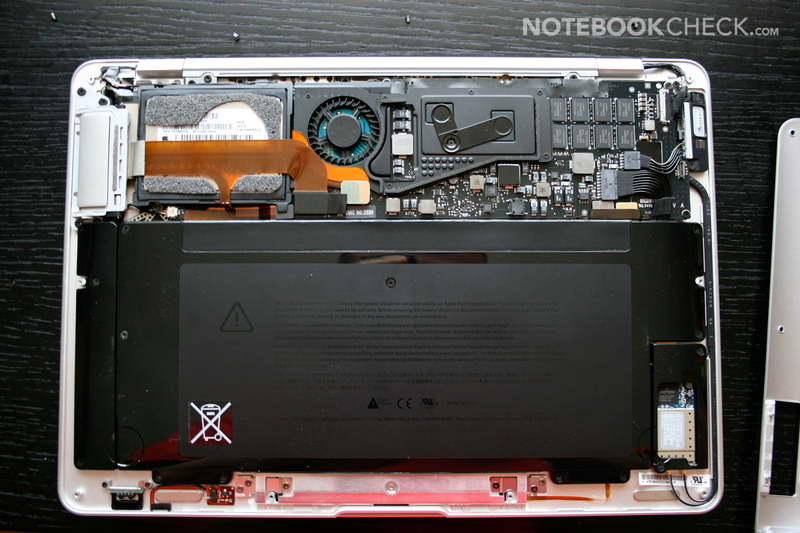 Now on to the core point of the new MacBook Air version, the performance. In the 2008 version of the MBA there was an Intel Merom CPU and an integrated Intel GMA X3100 graphics solution, so Apple fairly took the next step with the updated version. 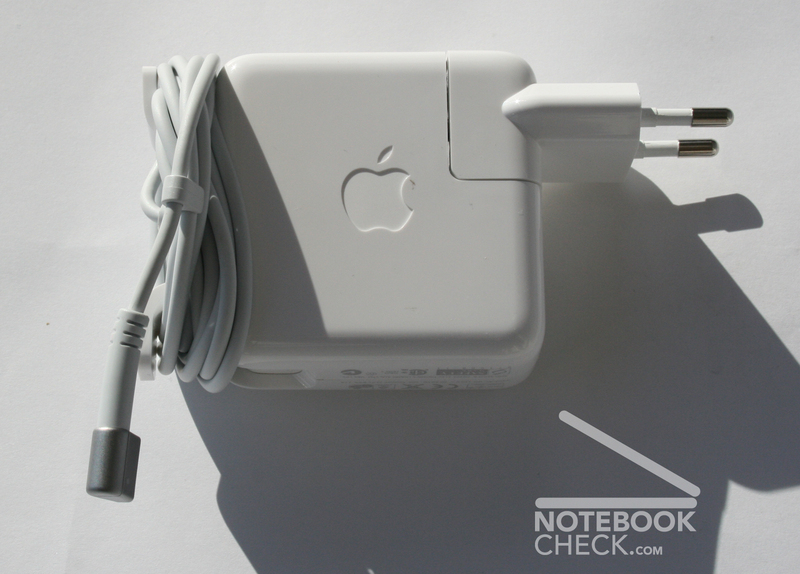 Our review unit is the currently most powerful and thus most expensive MacBook Air variant. As a CPU there's installed a Core 2 Duo SL9600 from Intel, a current Penryn dual-core processor with a full 6MB L2 cache and a maximum clock speed of 2.13 GHz. The label SL thus stands for a particularly energy-efficient CPU, whose TDP value (thermal design power) is just 17W. The currently very widespread Pxxx chips from Intel are placed clearly higher with a TDP of 25W. Indeed, efficiency also has a price. Intel names a price of 316 US dollars with the purchase of 1000 pieces. At the same price you can also get a T9600 chip at 2.8 GHz, which certainly requires a lot more power with a TDP of 35W and presents an immensely higher cooling load for the system. 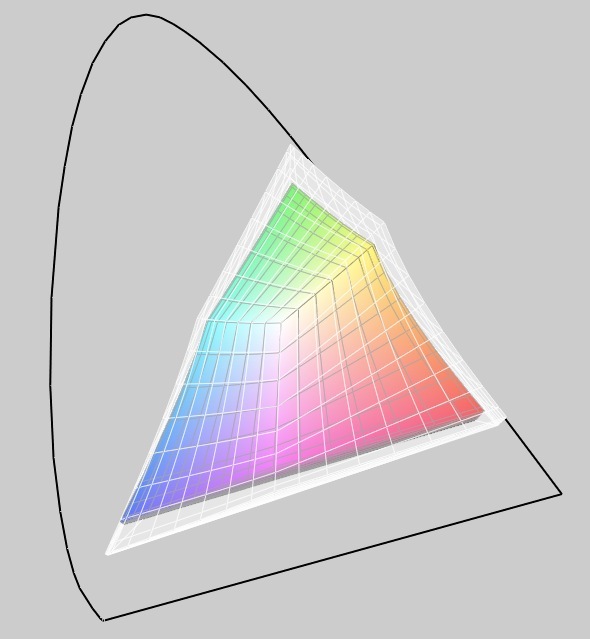 Admittedly it also gets exciting when it comes to the new graphics solution. The GMA X3100 was more of a rather pre-historic integrated graphics chip, yet the GeForce 9400M graphics can rejoice in a current improvement not least because of ION. In terms of performance the 9400M solution is clearly ahead of that of other ultra-slim notebooks, the Intel GMA 4500M HD graphics solution. Chips in the form of the G 102M, ATI HD 3470 or the GeForce 9300M G rank on a comparable performance level. Another advantage of the integrated 9400M is the possible usage of the rendering cores using OpenCL or CUDA. Concerning hardware equipment and form factor the MacBook Pro 13 really might count among the nearest competitor in the Apple house. The comparison of the Cinebench R10 benchmarks shows that ultimately large gaps exist regarding performance. Whilst the new MBA can clearly surpass the 2008 configuration, in particular the OpenGL graphic performance turns out to be impressive, the device actually clearly remains behind the MacBook Pro 13-inch. The MBA staying behind the MBP 13 is easily readable based on the offered performance and also based on the results in the Xbench 1.3 benchmark test. What follows are the average results of three runs, because on Xbench there can be inconsistencies in results, out of experience. The Geforce 9400M G graphics card from Nvidia can also support the CPU when treating videos. For example in the test all Full HD (1080p) trailers from trailers.apple.com ran in Quicktime Player X fluently with minimal CPU load. The processing performance of the graphics chip might be used better in future by Snow Leopard and Windows 7, e.g. in transcoding videos or audio data sets. Even if they are in the shadows of the CPU and GPU, the memory and hard disk are important components, which also directly have an effect on the performance in day-to-day use. In both regards Apple draws up promising hardware. Thus in the current version of the MacBook Air there's a total of two gigabytes of fast DDR3 memory, which is indeed soldered directly onto the motherboard. Eventual upgrades therefore will fall flat. Performance is also promised by the 128 GB SSD in our test device. Alternatively the current MBA is also offered with a 120GB / 4200 rpm hard disk (1.8“). The performance of this disk should, however, remain clearly behind that of an SSD. 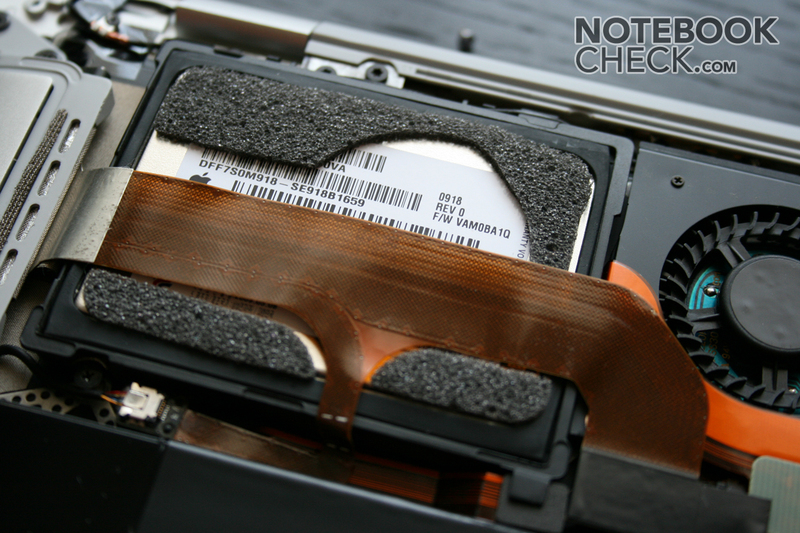 More on that in our extensive SSD test report. The price difference of both versions is certainly enormous. You have to take into account up to 300 Euro alone for the upgrade of the mass storage medium. You will indeed be rewarded by a noticeable improvement in office performance with extremely short load times. 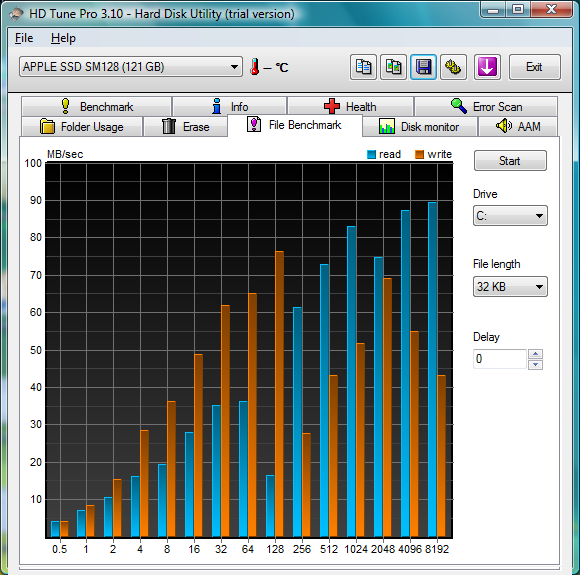 The 1.8“ SSD from Samsung can indeed score points in comparison with hard disks, in particular the slow 4200 rpm disks, yet in comparison to current, fast SSDs (e.g. from Intel) the SSD from Samsung is rather weak. The maximum read rates of just short of 100 MB/sec are still thoroughly competitive, however the write rate, at over 55 MB/sec remains clearly behind strong SSDs at over 100 MB/s. The important 4K read- and write-speed is 16.7 MB/sec for reading, which is thoroughly considerable, for writing just short of 6 MB/sec is, however, rather weak. As you only have the choice between a very slow 4200 rpm HDD and this Samsung SSD in the Air, the choice should clearly be the SSD for power users, as it clearly speeds up daily work. In Windows Vista (using Bootcamp) we took a look at the performance of the components more closely. 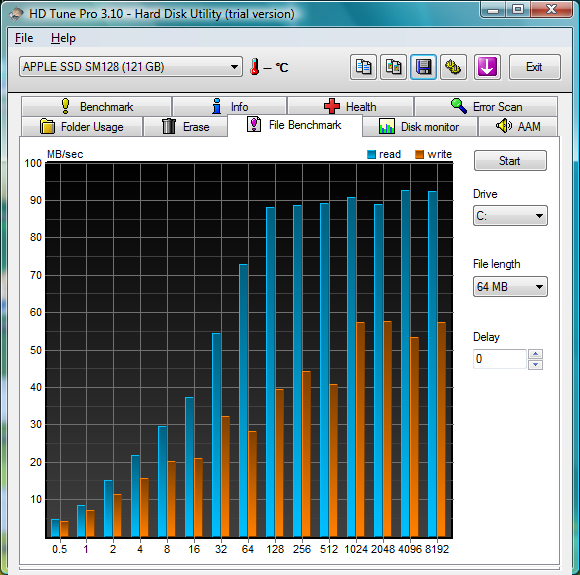 Theoretically the 2.13 GHz Core 2 Duo L9600 should show a very good performance thanks to 6 MB L2 cache. In the benchmarks, however, extremely fluctuating results stood out to us. According to different tools the CPU mostly only runs at 1.6 GHz and is thus clearly slower than the data sheet values promise. Apparently the cooling capability of the thin case isn't enough for the relatively fast CPU. With an external notebook cooler, tested in cold condition directly after turning on, we reached clearly better results than in warm condition. Thereby the performance ranks between that of a 1.2 GHz SU9300 up to a 2.0 GHz T7200 Core 2 Duo. From permanent load you can, however, only expect performance from the lower end of the scale. Interestingly a stress test on Mac OS lasting for several hours with a subsequent Cinebench run provided no diminished results compared to a cold test device. Certainly the performance drop turned out to be blatant on Mac OS when using the device on a soft surface (couch). Here the MBA merely reached a fraction of the results measured previously. On the whole it also stands out that the results of the Cinbench benchmark test in cold condition turn out somewhat higher on Windows than on Mac OS. Unfortunately as usual for Apple computers, the DPC latencies on Bootcamp (3.0 of Snow Leopard) were very high and sound and audio streaming over USB are not advisable. Only by terminating Bootcamp.exe (relevant e.g. for the special functions of the keyboard) in the taskmanager the DPC latencies did fall into the yellow and green region (see diagram). No noteworthy changes have been made to the noise characteristics of the MBA. In office use with word processing, mail and internet the notebook is subjectively not noticeable. The ventilator here runs at around 2500 rpm. Rather higher fan frequencies are also possible, but with a maximum of 32.3 dB(A) the MacBook Air still remains constantly subtle and almost inaudibly in the background. In the stress test (load of the CPU and the GPU) the deployed case fan then becomes noticeable. With a noise level of around 42.9 dB(A) at more than 6000 rpm the MBA can even be described as clearly audible. This fan level is also sometimes reached at high load in normal office use. Within the scope of the test we could every now and then hear a kind of quiet creaking/rattling/squeaking, similar to the noise of an HDD during an intensive access. The SSD indeed eliminates noises, after which only the system fan or cheeping transistors can be made responsible for this noise. As this is indeed only noticeable in very quiet surroundings, a very positive overall impression remains. As usual, we not only test the operation under load (load of core components for 1-2 hours) but also operation under maximum energy-saving options after at least two hours of use. In the first case a thoroughly presentable warming could be noticed on the surfaces of the MBA. Thus the maximum temperature on the upper side in the area to the left above the keyboard was at 43.7 °C. Also the underside warms up considerably under full load after several hours. As a maximum we could notice 46.1 °C. The warming up in office use turns out completely to the contrary. The upper side had no more than 32.3 °C as a peak value and also the underside remains in the uncritical area at 33.6°C. As long as you however surf in the internet on sites supporting Flash, the temperatures swiftly swing between the loading case and the office case. It can thus become thoroughly warm on the lap. 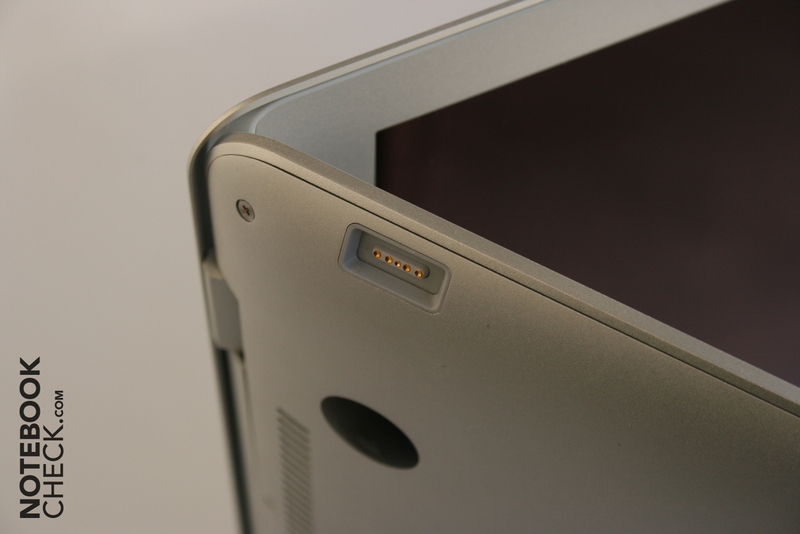 The MacBook Air apparently only has a single loudspeaker, which is situated in the area of the arrow keys, on the inside of the case. When typing the right hand is situated over the sound source, which clearly dampens the music quality. Otherwise the offered sound can be considered to be adequate for undemanding sound. Still, the mono sound quality is not very attractive on the whole. 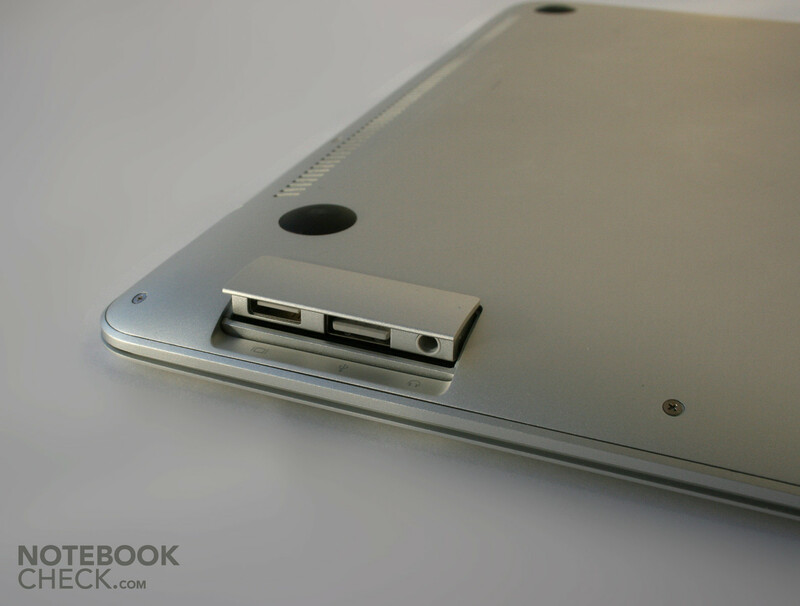 The current MacBook Air is equipped with a permanently integrated 40Wh lithium polymer battery. Apple boasts a battery life of up to 5 hours of "wireless productivity". In our review the maximum battery life (minimum brightness - level 1, Airport deactivated) that we could notice was a time of up to 430 minutes, which is more than 7 hours. Under load (CPU and GPU) the MBA still holds on for 120 minutes, that's 2 hours. In our bootcamp installation with Windows Vista we have also tested the battery life under load (BatteryEater Classic Mode). Here the integrated battery lasts for 1 hour and 38 minutes, so somewhat shorter than on Mac OS with a comparable load. In WLAN operation, with maximum display brightness we only reached a battery life of 170 minutes (Mac OS). With its battery life specification Apple might thus act on the assumption of a diminished display brightness. Looking at the energy consumption also shows why. The MBA draws on only 7.0W at minimum brightness from the power supply, so at maximum brightness it is already 10.2W, so around 50% more. 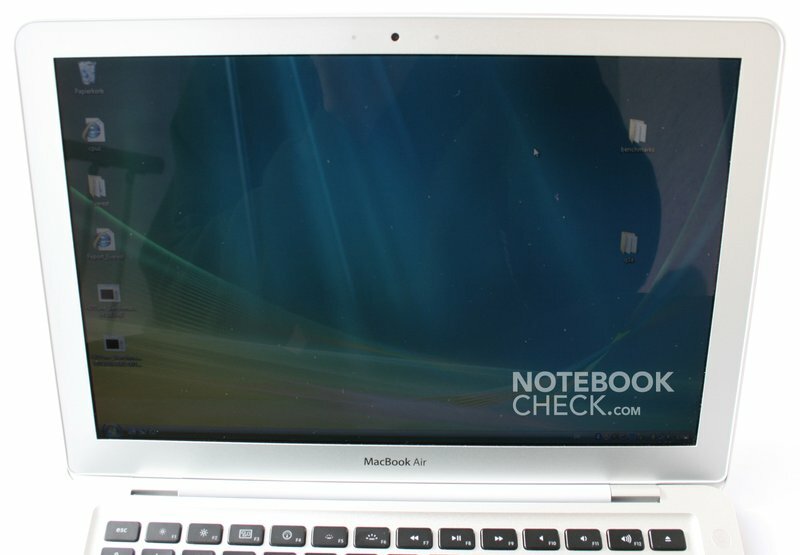 Compared to the MacBook Air version from 2008 no noteworthy changes have been made. Indeed, if you allow for the considerable performance rise, you could also consequentially value the sustained battery life results. On the whole a somewhat longer battery life would nevertheless not damage the mobility of the laptop, particularly with regard to the battery not being exchangeable. Much has remained unchanged, some things are clearly upgraded. Also the camps of Apple friends and 'enemies' persist presumably unchanged. 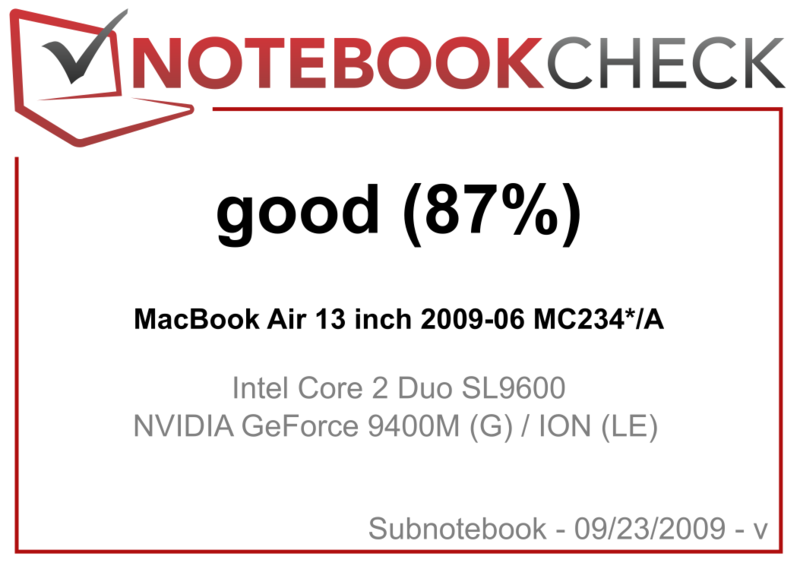 As a testing editor I, of course, have to offer praise as well as criticism concerning the current MacBook Air. Yes, the MBA is as always unmatched when it comes to workmanship quality and material impression. Possible competitors like the Dell Adamo, the Thinkpad X300 / X301 or also the MSI X340 have no chance in this regard. Again yes, I already had all mentioned laptops in extensive use. Nevertheless there are points that you have to critically cross out. For example there's the connectivity, which can be described as more of an outrage. Only one USB port really is not ok. Mouse, UMTS modem, USB stick, ext. hard disk etc., all these are real problems for the use of the MBA, or better said, as long as two options overlap each other. Then there's the position of the USB port. All jacks differing from the slim USB standard lead to problems with the Air. We can also criticise the lack of a LAN port, the alternative being LAN via USB which, considering the above problem, doesn't seem particularly attractive. Furthermore the ignorance of Apple towards new communications technologies is a shame. UMTS/HSDPA in integrated form would be highly desirable in Europe, even in view of the otherwise excellent mobility of the laptop. The problem of the glare type display isn't optimally solved but all the while it is solved as much as possible. The excellent brightness as well as the anti-reflective display surface allow outdoor use of the laptop. 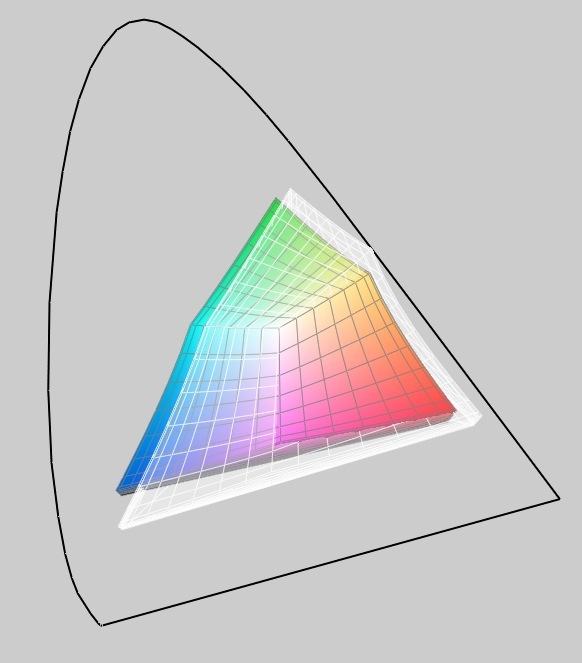 The high contrast is however a plus point of the smooth display surface. Be that as it may, a matte surface would nevertheless be preferable. Also the poor illumination of the display surface is rather negative. The performance of the components is surely adequate for day-to-day use. In particular the 9400M graphics can flex their muscles in videos and games compared to other integrated graphics cards. 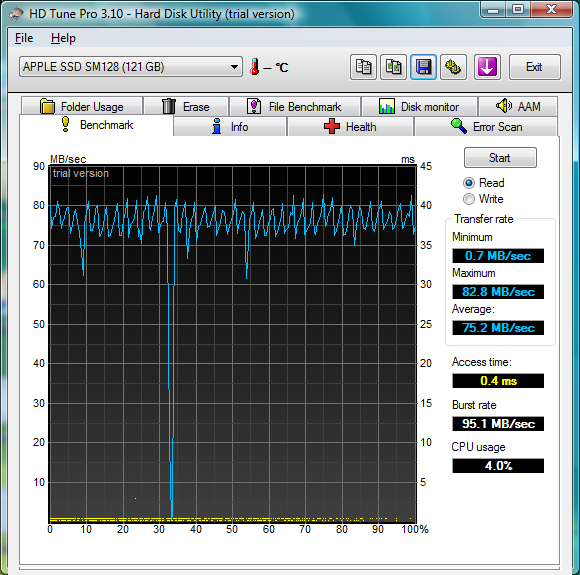 The 2.1 GHz Core 2 Duo CPU unfortunately doesn't quite provide the expected performance, at least on Windows. Apparently the processor mostly clocks in at 1.6 Ghz and downwards, perhaps a tribute to the flat design. Thus you can save yourself the strong variant of the CPU at 2.1 GHz and just get the 1.86 GHz version. On the whole, the verdict turns out to be so divided, probably also how notebook users' predominantly broad opinion of the MacBooks presents itself. Hardware to and fro, the crux of the matter is still the operating system. Windows Vista/7 or Mac OS is the question, and it is ultimately more meaningful than many a hardware measurement. With bootcamp, Windows indeed presents an alternative, however here Apple offers a clearly worse overall performance. 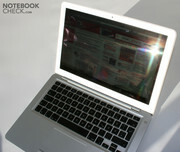 The Apple MacBook is one of the thinnest notebooks in the world. the layout follows the Apple conventions. 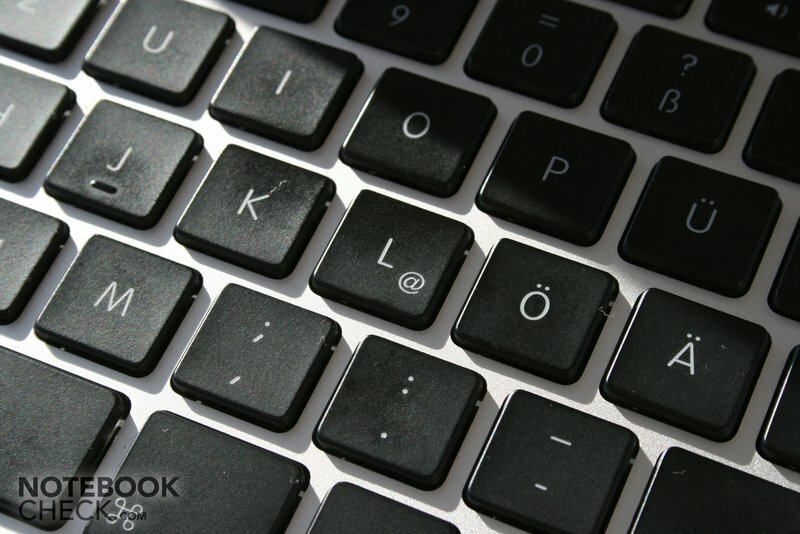 In darkness, the brightness sensor activates the practical keyboard illumination. 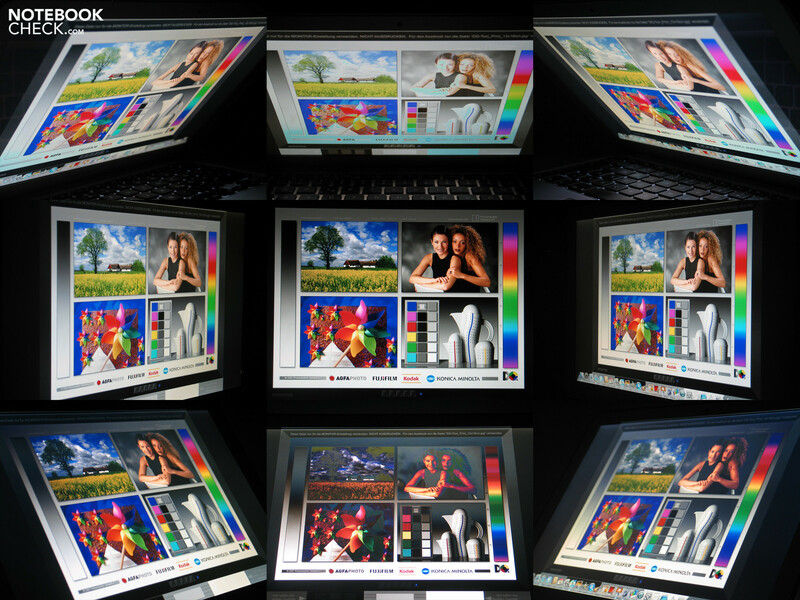 The bright 13.3" display with LED background illumination is completely convincing, also conditionally in outdoor use. In direct sunlight you can recognise the special coating which certainly can't completely prevent reflections. By detaching the case hub you can have a look at the insides of the MBA. ...as well as the 1.8" SSD with a capacity of 128GB. The fan remains subtly in the background for the most part. The battery lasts for between 2 and 7 hours, but in practise this is around 3 hours. Under full load the case rather noticeably heats up, when idle the MBA however mostly remains cool. Of course Windows Vista can also be installed on the MacBook Air, however with slight limitations concerning the input devices. The keyboard is convincing with full-size keys - only the arrow keys are somewhat smaller than usual. 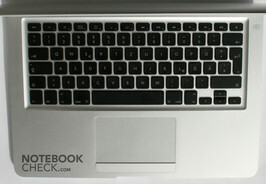 The input devices are - above all for a subnotebook - excellent. The built-in webcam and the 2 microphones allow for mobile video communication. In comparison the already very thin MacBook Pro seems overweight. 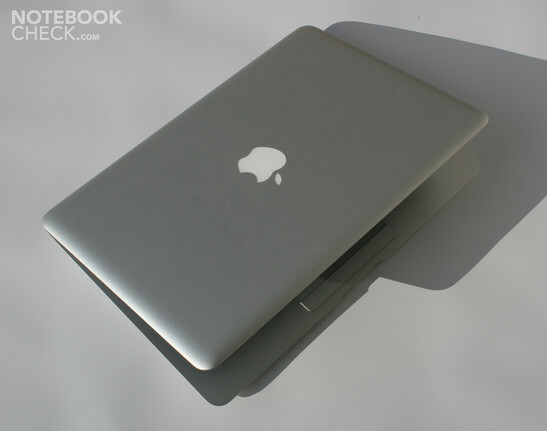 The workmanship is excellent and the aluminium case seems very high-quality. 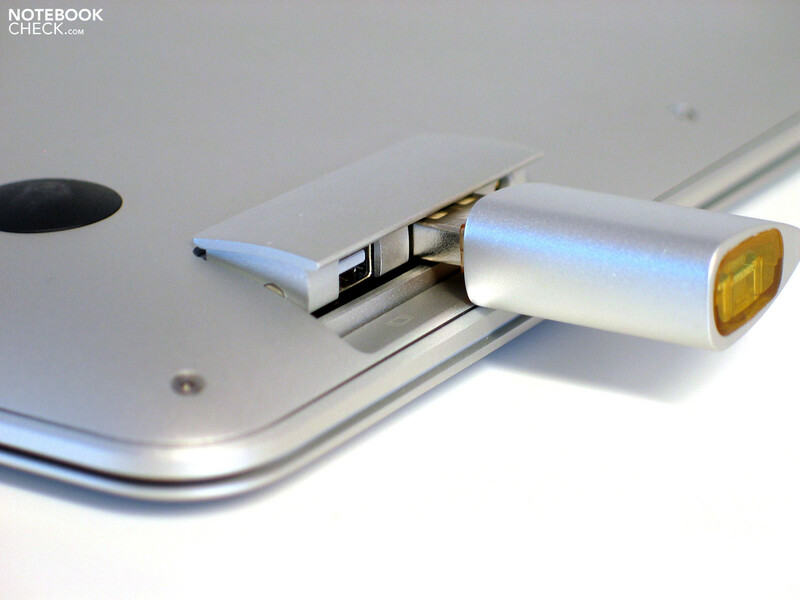 The special hinge limits the maximum opening angle - typical Apple. and is kept in place by a moderately strong magnet. ... and offer only the most important connections. A USB hub is practically compulsory. The infra-red port is unfortunately unidirectional, so it can only be used with the remote. ... and indeed protects the laptop from an unintentional tug at the same time. 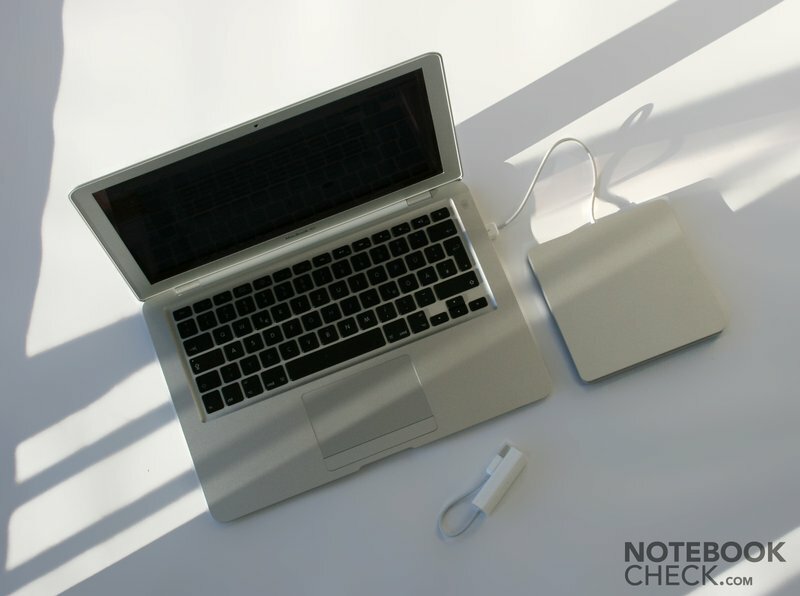 The USB superdrive and the USB network adapter are useful, but all the while optional accessories subject to surcharges. ... if not as an all-round notebook. As always: the first-class aluminium chassis in one piece. The flat design furthermore makes the MBA an ideal companion, despite the 13-inch display. The wish list for the MacBook Air basically stays the same: at least one more USB port, a matte display variant, integrated UMTS/HSDPA. How far ahead of the times Apple was (once again! ), when more than a year ago, still before the large netbook boom, the MacBook Air was introduced in its first configuration variant.